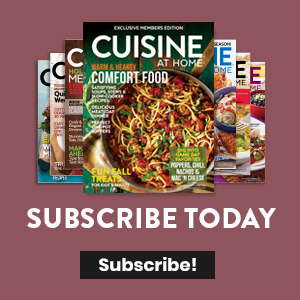 Learn all about buying and trimming pork ribs — baby backs and spareribs. 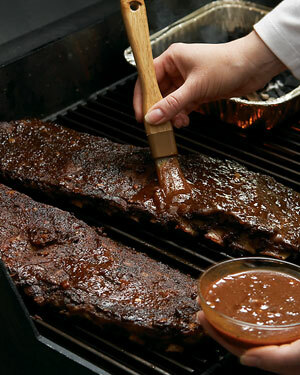 A simple rub and sauce is all your ribs need (check out our recipe for Spicy Dry Rubbed and Grilled Spareribs with bock barbecue sauce. For optimum tenderness, roast your ribs prior to grilling them. And, for that unmistakable smoked flavor, the ribs must be slow-cooked on the grill over indirect heat with smoldering wood chips. Great barbecued ribs start by choosing the right type. And a little information up front makes the choice easy. Baby back ribs and spareribs are simply different portions of the same rib cage. 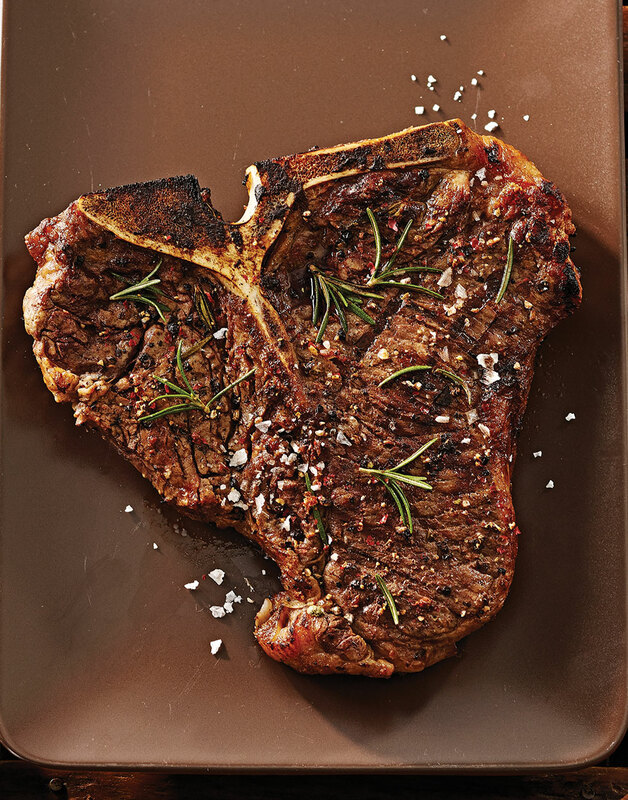 A slab of ribs contains 11–14 rib bones; for the following recipe, you’ll need 2 slabs. Warehouse stores carry slabs of consistent size and quality. Baby backs (above, right) are the ribs at the very top of the hog’s back, extending from the spine to about a third of the way down the rib bones. These small and often pricey ribs are left behind when the pork loin is removed. Calling them “baby” has nothing to do with the age of the animal, but rather their small size and weight. Spareribs (above, left) are the lower section of the rib cage near the hog’s belly. Because the muscles here are well exercised, the meat is tougher and fattier than baby backs. But when cooked using the technique that follows, these ribs can be just as juicy and tender as baby backs. And since spareribs come from the same area as bacon, the meat is very flavorful. For our purposes, here, we're focusing on spareribs. And they require a little trimming before roasting and grilling. But don’t let that stop you from giving them a try — they’re definitely worth it. 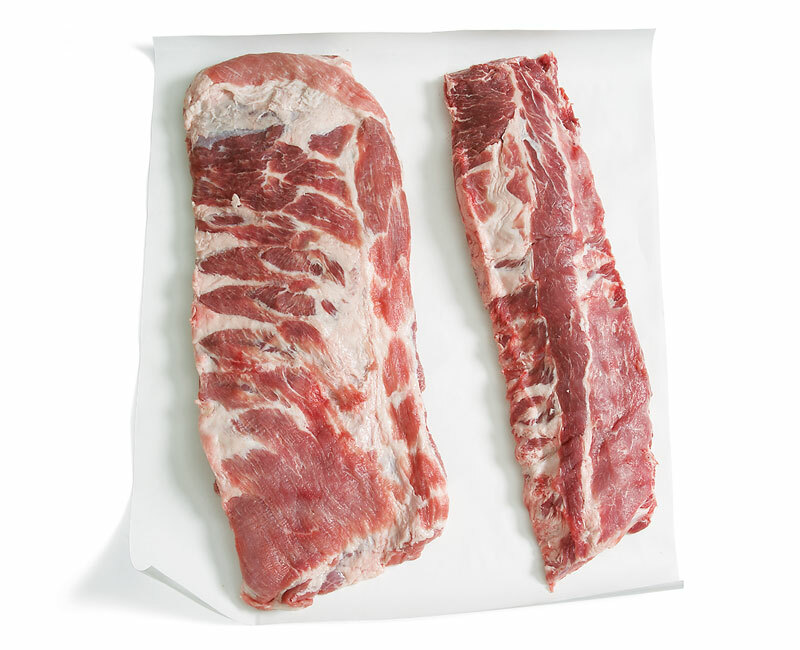 Regardless of whether you opt for baby backs or spareribs, the sinewy membrane on the underside of the slab must be removed—it won’t melt during cooking. Grab a corner of the membrane with a paper towel and pull it away from the bones. Finally, trim off excess fat and pierce the ribs with a fork before applying the rub in Step 3. Remove the skirt flap located on the membrane side of the ribs. Grill it or save to use in soups or stews. 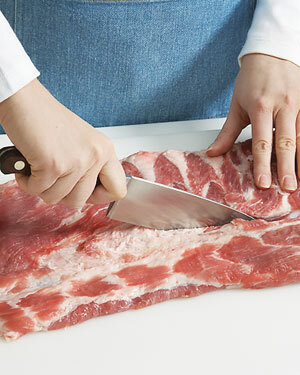 Flip the ribs over and cut off the rounded portion connecting the rib bones so the rib ends are visible. Remove the membrane by pulling it with a paper towel. It must be removed before cooking or grilling. To help the rub penetrate the meat, “dock” the ribs by inserting a fork between the bones. People tend to get fancy with rubs, and that’s okay — there are millions to choose from, it seems. If you have a favorite, feel free to use it. 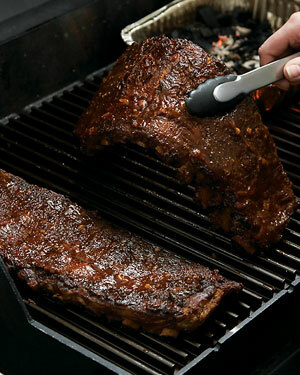 But to keep the focus on the ribs, use the rub in this simple rib, rub, & sauce recipe, Spicy Dry Rubbed and Grilled Spareribs with bock barbecue sauce. Plus, the rub itself works with nearly any rib and sauce. The chili powder does add a bit of kick, so pull back on it if you’re sensitive. 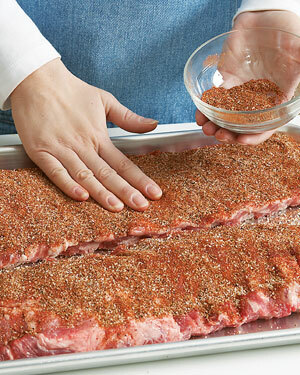 All you have to do is place the slabs on a baking sheet, liberally apply the rub (don’t skimp! ), then move on to Step 4—roasting them in a moderate heat oven. Apply the rub with your fingers, first sprinkling it onto the meat, then rubbing it in so it sticks. Hard-core barbecuers would never precook ribs in the oven before smoking. But roasting them at a low temperature (300°) is easier than maintaining constant, steady heat on a grill. The fat and connective tissues melt away, leaving the ribs tender and juicy. Plus, they won’t burn or blacken like they can over an open flame. 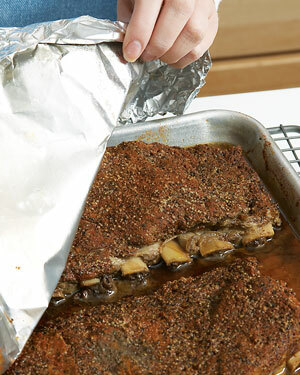 Seal the ribs on the baking sheet with foil, crimping it around the edges so steam can’t escape; the steam keeps the ribs from drying out. Then, slowroast the ribs in the oven for about two hours. 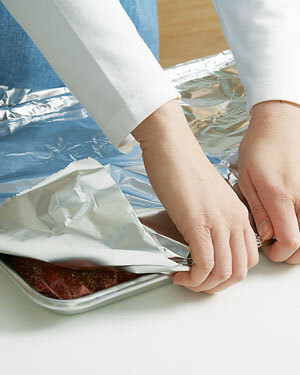 Tightly cover the baking sheet with foil to seal the moisture and steam in the pan. Moist, slow cooking keeps the ribs tender and juicy. When the fat and connective tissues have rendered, the meat will pull away from the rib bones, exposing the ends. They’re now ready to grill. The final step is to finish the ribs on the grill over indirect heat. 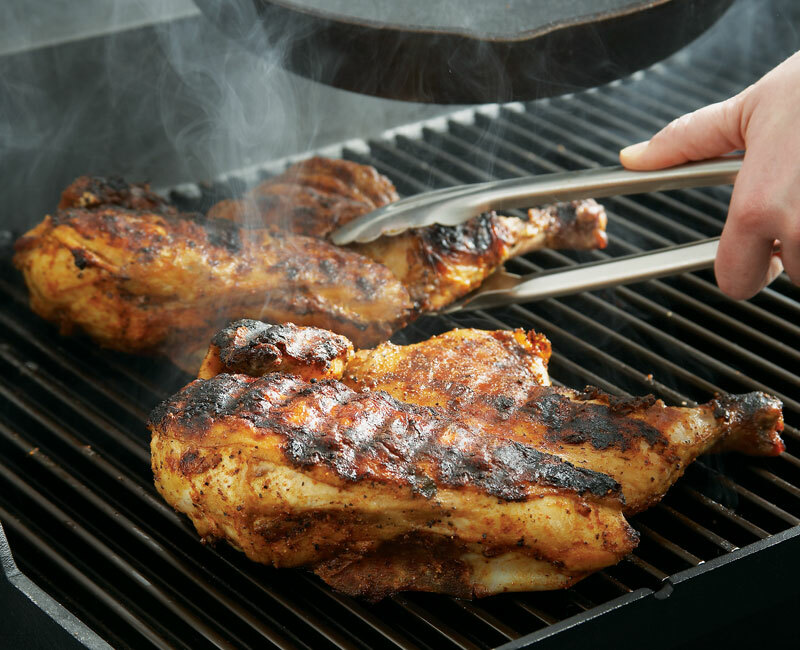 Here’s how: Preheat half of the grill to high and leave the other half unlit to maintain a grill temperature of 300–400°. 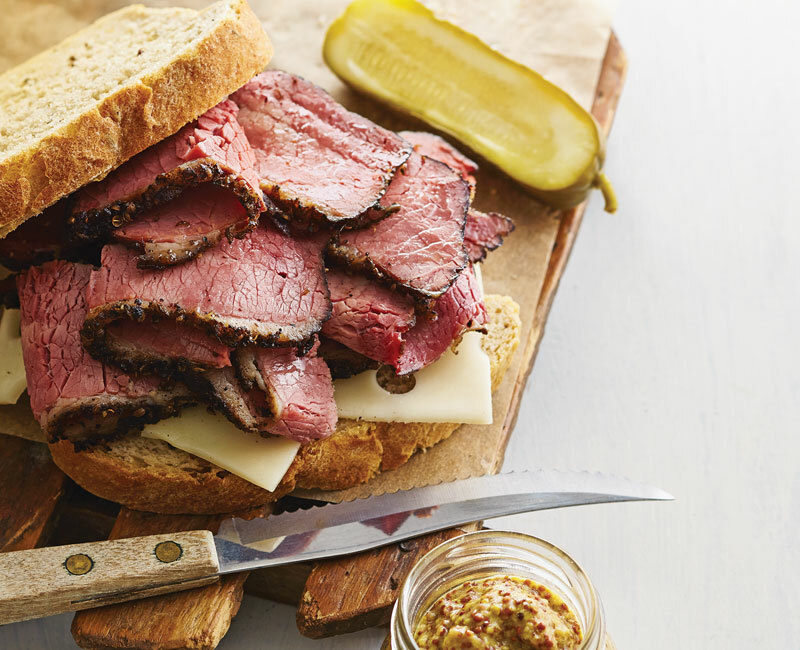 The great thing about indirect grilling is that you can smoke and grill at the same time. (If you’re not a fan of smoke, just grill the ribs over indirect heat.) 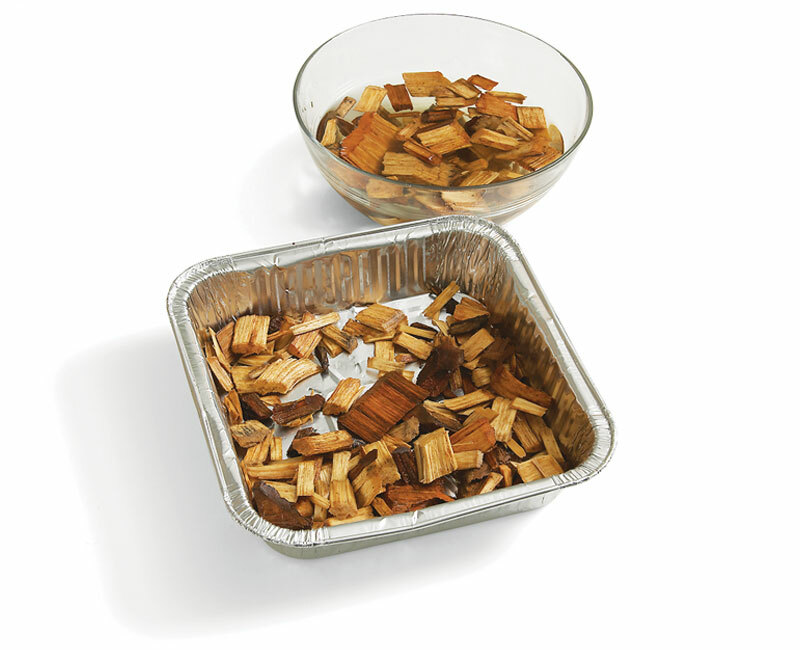 Do this by placing the wood chips, see below, in a disposable pan (or build one out of foil) over the lit portion of the grill. When you start to see wisps of smoke rise from the pan, slather the ribs with sauce (you can turn to the same Spicy Dry Rubbed and Grilled Spareribs with bock barbecue sauce recipe.) Arrange the ribs, sauce side down, on the unlit portion of the grill. After an hour, slide a skewer into meat — if it goes in easily, the ribs are done. If not, keep grilling until tender. 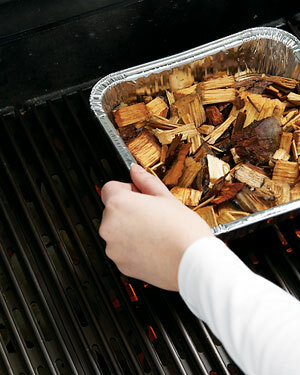 MAKING SMOKE: Hickory or mesquite chips are excellent for smoking. Soak 3 cups in water according to package directions, then drain. Poke small holes in the bottom of a disposable foil pan, add the drained chips, then set the pan over the lit portion of the grill. Turn the ribs every 15 minutes, slathering them with barbecue sauce each time. This helps keep them moist and adds flavor. After 1 hour on the grill, test the ribs for doneness. 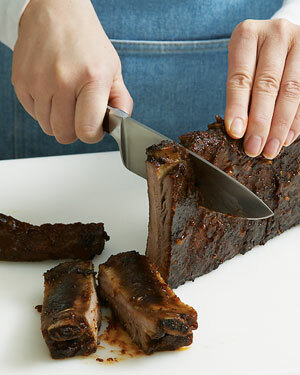 With tongs, lift the ribs from the center of the slab—if they droop, they’re done. Let the ribs rest 10 minutes, then slice into individual ribs by holding the slab vertically and slicing down between the bones.